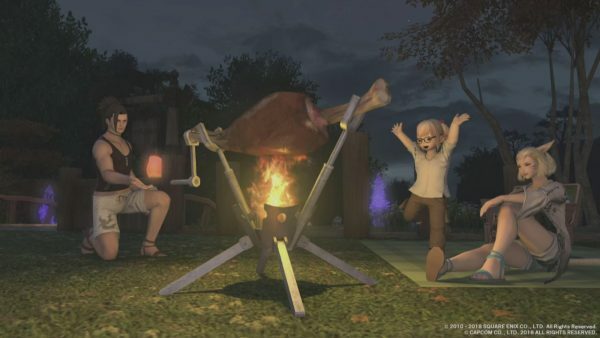 The latest edition of Letter From The Producer Live, a Japanese livestream regularly held by Square Enix to announce and promote upcoming content for Final Fantasy XIV was held last night in the early hours of the morning (for those of us in North America). 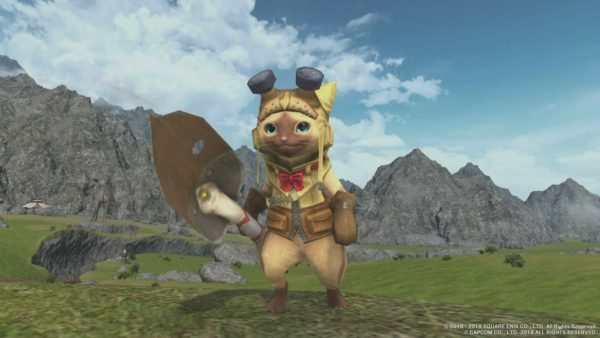 FFXIV Producer / Director Naoki Yoshida was joined by Monster Hunter World Director Yuya Tokuda and Monster Hunter World Art Director Kaname Fujioka. 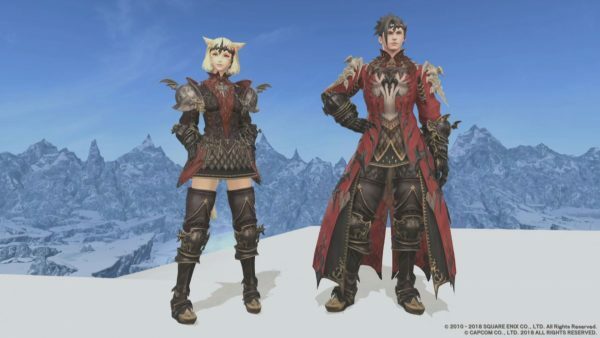 The trio went through a number of new developments including the release date for Patch 4.4, further details surrounding the MHW Collab event and even a second entry in the Eorzea Encyclopedia book series. This article discusses content found within the end of Final Fantasy XIV 4.3: Under The Moonlight. If you haven’t finished that MSQ content, stop reading right now. Final Fantasy XIV‘s next major patch will be titled ‘Prelude In Violet’ and we finally have the first details regarding the new content then will be coming our way this September and it’s sounding like a juicy update. New Dungeon: The Burn SURPRISE! That brief playable section where you got to control Alphanuad in the then unseen province of The Burn was not only teasing a huge story stinger but also the next playable dungeon. 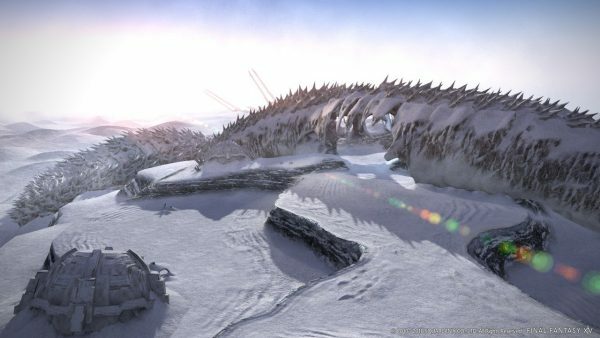 It was a huge surprise at the end of the last patch to see Alphanuad and his Garlean companions airship crash in the desolate land, only up until now teased on a fan translated map of Eorzea released in the lead up to Stormblood. Seems like the Warrior of Light will be really feeling the Burn this next patch. New Dungeon: Saint Mocianne’s Arboretum A normal version of this dungeon was original released in Patch 3.1 -“As Light, So Goes Darkness” way back in 3.1. 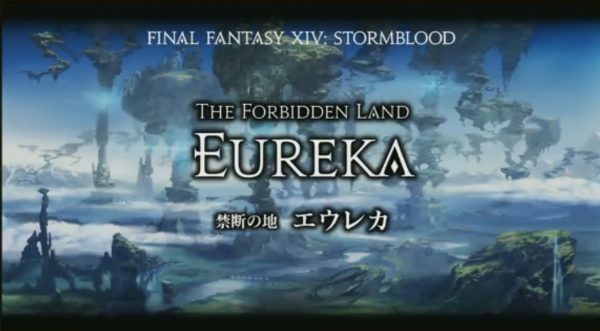 Now in the twilight of the Stormblood era we’ll get to revisit the Arboretum for a harder encounter. 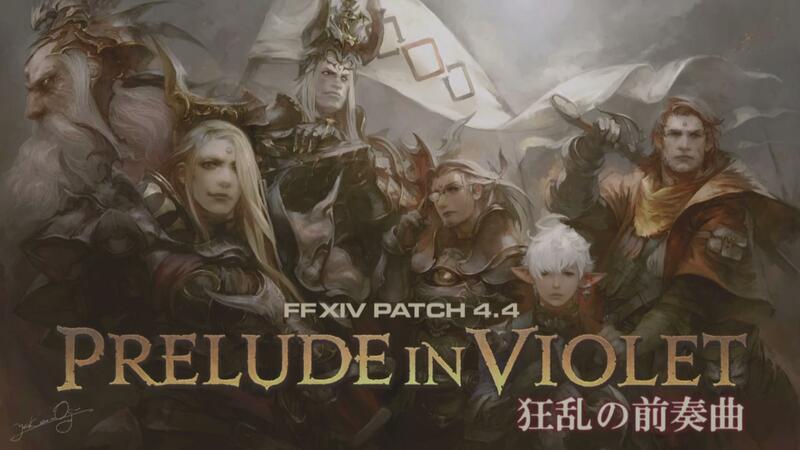 Title & Key Art: The title for FFXIV 4.4 will be titled “Prelude In Violet” and Key Art released for the patch (see header) prominently features members of the governing garlean class, including former emperor Solus zos Galvus who absolutely should be dead, given he is said to have died during the lead up to Heavensward. New Raid: OMEGA raid tier concludes with OMEGA Alphascape and Alphascape Savage. Role Action Changes: Each job will now have a total of 10 slots for Role Actions versus the current 5. It’s unknown if this is an admission that the Role Action system isn’t working as intended – as Role Actions like Refresh / Tactician for BRD / MCH and Protect for healers aren’t really optional or mandetory. Regardless it looks like we’ll all have 5 more actions to add to our hotbars next patch. This collaboration has been teased for sometime and we finally got to see what the Bahemoth encounter in MHW would look like – thanks to Naoki Yoshida playing the upcoming event with a few others during a recent Monster Hunter World live stream. 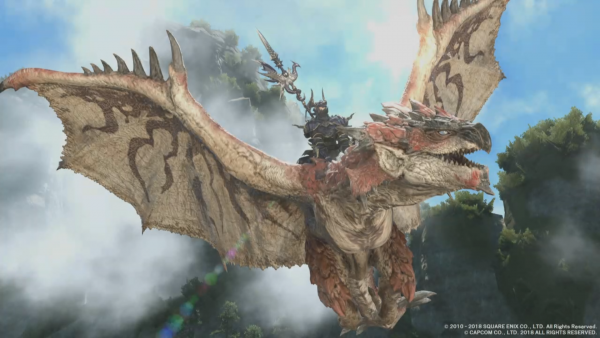 We now know that the Rathalos encounter for FFXIV will be coming as a cross over trial in two flavors – 8 person (normal) and 4 person (EX). Players looking for harder 4 person content finally now have something to sink their teeth into! Requirements: Complete the Stormblood SQ and obtain level 70. 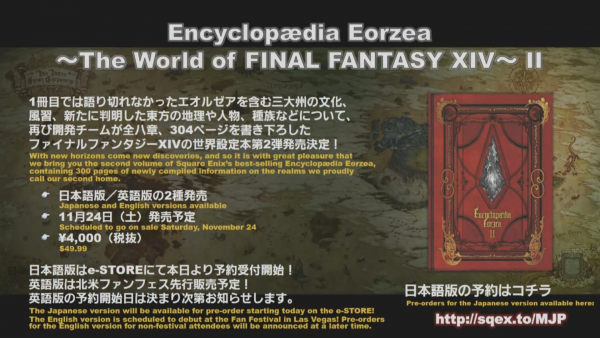 The next installment of the Eorzea Encylopedia series, which will cover content from Patch 3.4 forwards is set to be released THIS YEAR. English and Japanese versions to be made available. JPN pre-orders already live on the official website. Will be available at the Las Vegas Fan Fest. Pre-orders for non Fan Fest attends TBA. Scheduled to go on sale on November 24th.